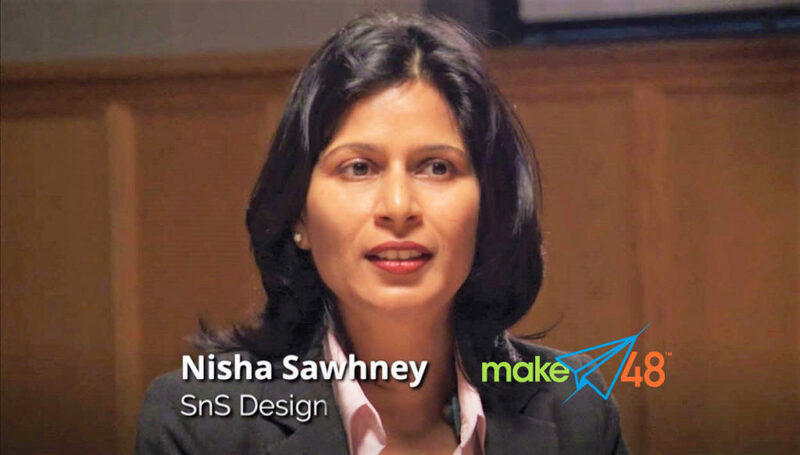 SnS Design Featured on PBS's | SnS Design, Inc. SnS Design CEO Nisha Sawhney Featured on PBS – “Make48” – SnS Design, Inc.
Nisha Sawhney, CEO of SnS Design of New York City, is featured in Season Two, Episode 3, as a focus group pre-judge and product design expert for the new-product development hit creativity reality series, “Make48.” Episode 3 was filmed several months ago and is now airing on PBS as well as being streamed to 200 channels. “Make48” shows SnS Design helping select one of the winning products as it is designed from scratch all the way to the final product. “Make48” is inventing against the clock. Teams apply and compete to develop an idea for a new commercial product in a 48-hour invent-a-thon weekend. Teams have to plan, prototype, and pitch within the specifications of a challenge, revealed at the start of the 48 hours. Sawhney was a mentor for the 12 teams from around the U.S. who were given the challenge of developing an outdoor entertainment product. Teams from all ages, backgrounds, and places develop ideas in 48 hours. 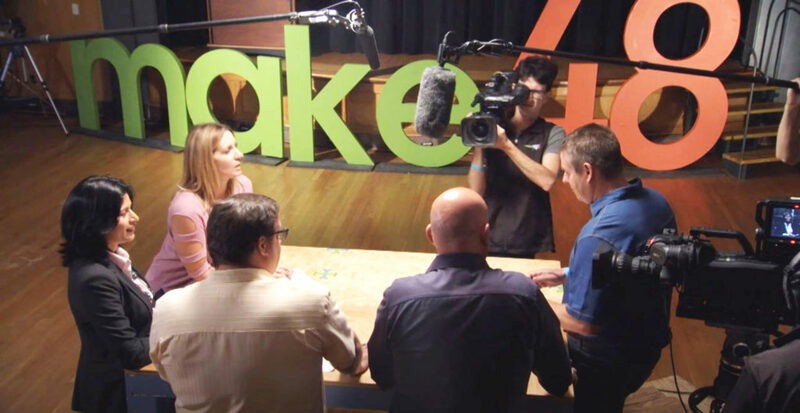 As Episode 3 begins, with the clock ticking and all teams gathered in the same “Make48” room, teams hit the ground running to brainstorm inventions. Ramping up the pressure on the creative process is the running commentary from focus group judges. In the focus group of product designers, manufacturers, owners, marketers, Sawhney’s “Make48” role was giving final advice and providing feedback on manufacturability, cost reduction, functionality, ease of use, and marketability that contestants would use to rethink their product. “We were there to help guide all 12 teams and educate them about every aspect of product development to help them get selected by the judges,” she said. 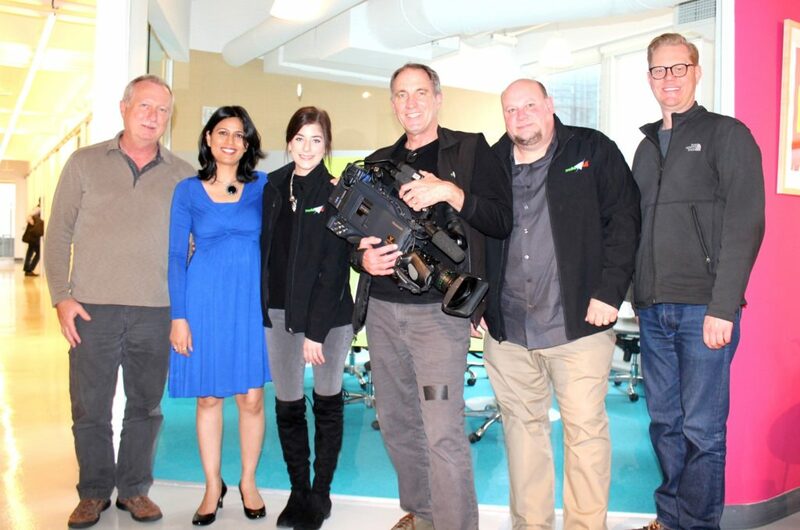 “Make48” provides insight into the innovation community, But Nisha also has worked on some of the biggest deals in the history of the reality TV series “Shark Tank.” There Sawhney offered client-personalized services that include a talented design team exclusively committed to a project. The results: A cost-effective solution with superior design and faster development rate. SnS Design, Inc. specializes in developing successful consumer products that sell. Founded in 2003, this New York City-based business offers a high-level global perspective that empowers businesses, entrepreneurs, and manufacturers with ideas that revolutionize industry. SnS Design is a full-service design firm which features client-personalized service that furnishes a talented design team exclusively committed to your project. The results: A cost-effective solution with superior design and faster development rate. SnS Design is a minority-owned, woman-owned business. We strive to understand our client’s needs, enhance the product development process, and bring a level of connection that bigger companies are simply unable to provide. We are experienced in designing a broad range of home appliances, consumer electronics, medical products, furniture, children’s products, and lifestyle products. Satisfied clients from USA to Japan. Experience working with entrepreneurs, startups, manufacturers, and Fortune 500 companies. Design got biggest deal in “Shark Tank” history. Featured in CES, Global Women, Entrepreneur Women, “CEO Radio” on WCBS Radio 880 AM.